WE ARE EXPECTING PUPPIES IN MIDDLE OF JUNE 2012!!! Another succes we had in Slovakia - Nitra, reaching two titles CAC, Cacib and BOB!!! We had already two CACs from Bratislava 2009, that made Demi Slovak champion of beauty! With our appenzellers we spend all our free time, we are going on trips, holidays and prolonged weekends. 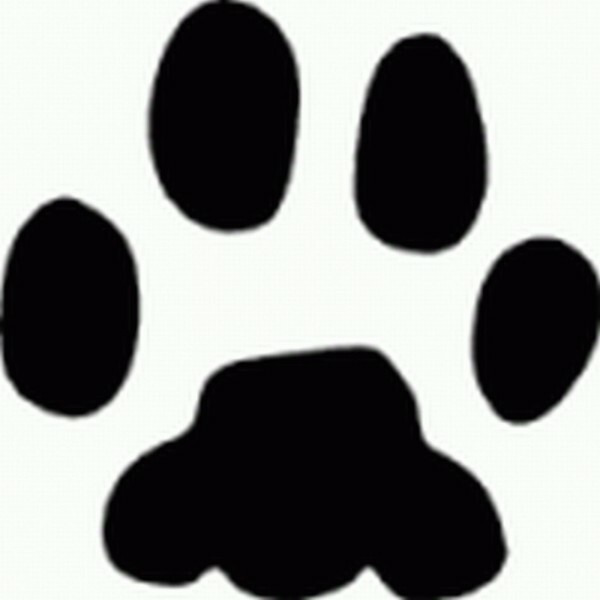 During weekends we are going to the obedience courses and agility, flyball or frisbee trainnings. 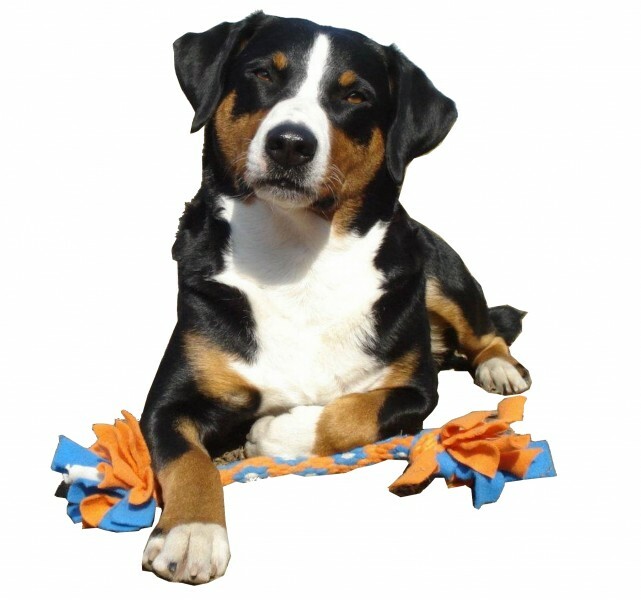 Appenzeller is very skilled dog...with correct motivation, he works very well. Our dogs live during our absence on the garden, when we are at home, they spend time with us. We have also cats, which they love and have no problem with. Our dogs practise for obedience exams, Demi passed already ZOP exam with VG, both of them have a certificate of talent to be a sheep dog. 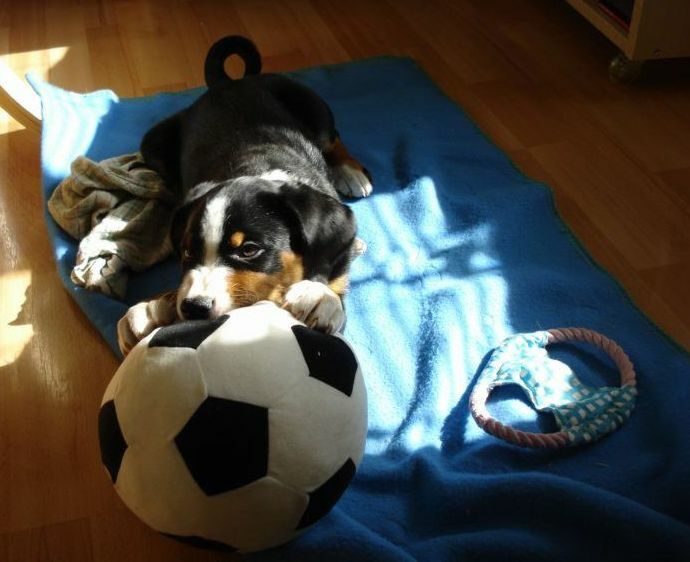 Appenzeller is a family dog. He loves his family to the death but bites rarely. Outside appenzeller will always run between all members of family and will take care you are all together :-). He will never run too far not to loose you. Even if found an interesting thing to hunt - especially young dogs in the nature and forests (rabbits, deer, birds, etc.) - will never hunt it too long because he would get too far from you. The most important periods of his life are about 2-3 months and then the whole first year. When you bring the small tricolor puppy, you must give him time to meet all members of your family. Then other people, but not all at once. When he knows all around your/his new home, you can take him out. Make short walks which would be prolonged slowly. Very important is to teach your puppy basic cleanliness, to show him where to make it. Puppy can not keep muscles till cca 5th month. That is a reason you cannot punish your puppy not to keep the need for long. At the beginning you must take your puppy out always after sleep, drink, meal, game which can be every 2 hours. If you need to leave your puppy at home alone for several hours, he will soon understand that he needs to keep it himself. After 6 months if accident happens, you can show him disagreement but do not beat him. Always take him out to try to make it again outside and commend him for making it outside. The best and very helpful is to teach him an order to make it when it is necessary. 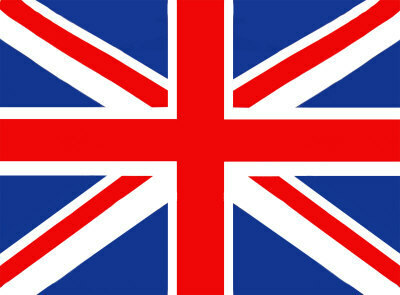 It will be helpfull when travelling for example. Your puppy must be also very well socialized. After all vaccinations you should take your puppy to the town (before you can meet dogs you know to show him other dogs and take him out but not allow him to eat anything from the ground!). Make him meet train, bus, escalators, etc. Also strangers and visit places where crowds are. Good place is a railway station. Show him different surfaces to walk on (iron bridges, etc. ), wearing muzzle. If you are planning to visit dog exhibitions, you should take your puppy to some exhibition when he is young. You can attend exhibition even in puppy class, which is very good for your dogs future. In the first year you should train a perfect calling on name, recalling. You should be able to recall your dog from ANY situation. This you should practise already from the first day when you bring your puppy home. To teach him learn/listen to his name and if you call him there is always something GREAT and WONDERFULL waiting for him. Play game, give him rewards, etc. It must be always possitive! And he must understand you are the most important thing on the world. You will appreciate it later when your dog grow adult :-). If I can recommend, do not leave your appenzeller only on the garden. Take him out everywhere with you, he will be well socialized, will know how to behave at visits, restaurant (or better garden restaurant), etc. 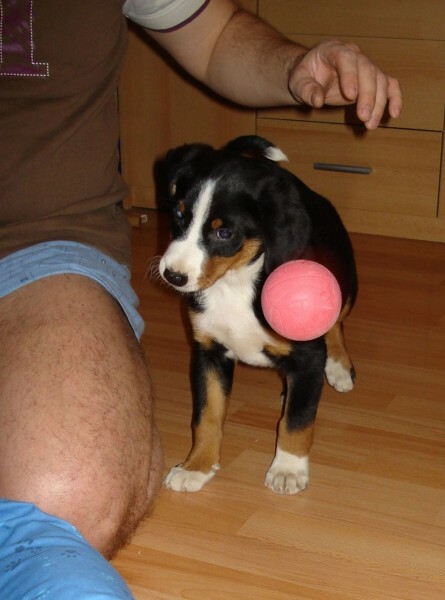 Appenzeller is very skilled for sports. He loves agility, frisbee, swimming and balls...you can try flyball as well.